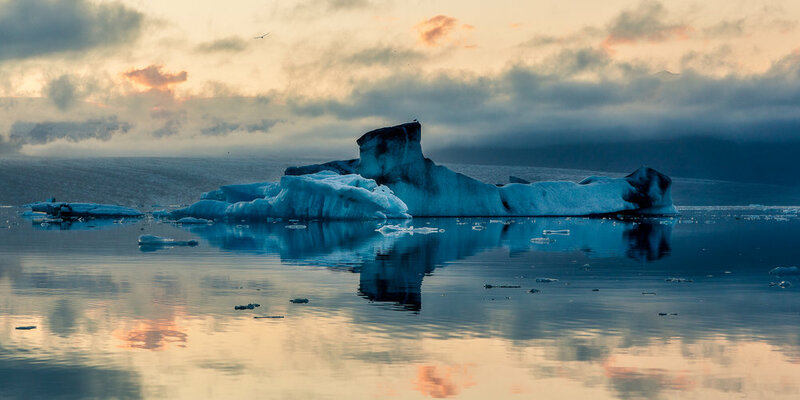 A huge iceberg in the shape of a submarine on Jökulsárlon Glacier Lagoon in Iceland. Question: When is it all right to place your primary subject in the middle of the frame? Answer: When it works best for you to do so. The Rule Of Thirds and the Golden Mean help photographers arrange the scenes they photograph into compositions that make sense. Photography 101 likely warns against placing the subject, like the horizon, in the middle of the frame. But there are times when it simply is the right thing to do. What's important is that you're aware of the horizon and place it in a way that's most appropriate for the image in question. A roughly 50/50 placement of the horizon in the image of the iceberg on the Jökulsárlón Glacier Lagoon made sense, from a compositional point of view. That's largely due to the fact that the image is constructed around a reflection and the water and sky are of, roughly, equal importance. However, I took a completely different, and somewhat unique approach to placing the horizon with the image of the sheep grazing on the Látrabjarg Cliffs in far northwest Iceland. 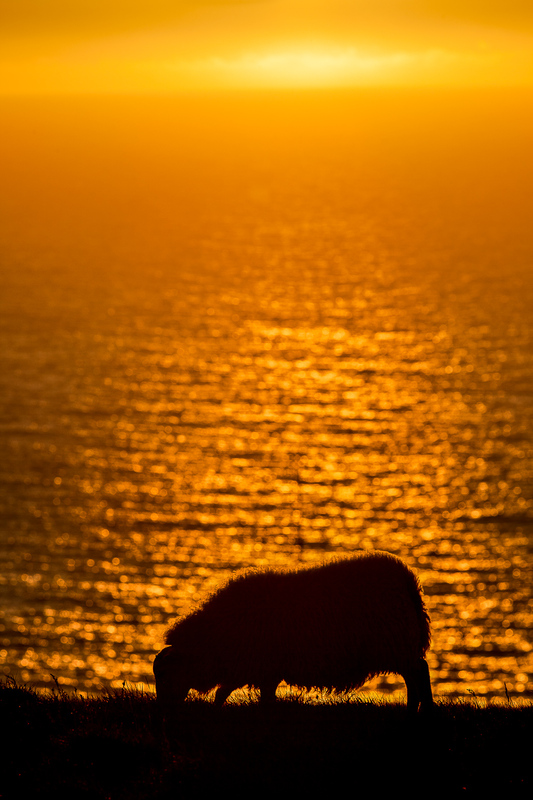 The color of the golden sunset on the water was critical to the success of this image. To maximize the amount of golden water in the image I opted for a portrait (i.e., vertical) camera orientation and tilted my camera so as to move the horizon up near the top of the frame. I think that's pretty straightforward and easy to see. However, balance is restored through a more subtle compositional choice. Notice how the dark earth at the bottom of the frame is similar in size to the brighter sky at the top of the frame. By keeping the size of these areas similar I believe the balance between earth and sky is maintained, as is the psychological relationship between light and dark. Should you expect most people to see these kinds of relationships in your photos? No! But it's quite possible that they feel moved by the image in question and that, on an intuitive level, it somehow makes sense to them. And intuition is what matters most. I don't spend my time thinking about this sort of thing when I'm making photos in the landscape. For the most part it happens automatically. But I've been a photographer and a teacher of photography for a very long time; and nine years of tertiary level study in the art of photography has to have an impact on how I go about making photos. What I do on this site is to deconstruct my photos in a way that, hopefully, helps you on your own road to a more creative, purpose-driven and meaning rich life. And I believe you can get there by learning to make better photos. Rules are okay as a starting point, but were never designed as a be all and end all. There should always be a reason why we do what we do. Composition, for all its merit, must be driven by something other than rules. Ultimately we make such decision based upon aesthetic choices and what it is we want to say or explore in the photos we make. Tiny niche's holding plaques and flowers in the grounds of Novodevichy Cemetery in Moscow, Russia. If your photograph is all about balance, symmetry or stability a central position is likely the best position for your subject, or the horizon, to reside. It may not produce the most dramatic result, but it will help you communicate the mood (e.g., stability) you're wanting to explore. The detailed photo of the niche at the Novodevichy Cemetery in Moscow has been meticulously composed. It's all about balance, order and repetition. And, while our eye's will wander to faces, flowers or colors around the display, it's the centrally placed vase of flowers that holds the image together. It's a relatively unremarkable object, but its placement in the frame does a lot to bring the individual elements together into a cohesive and harmonious image. This photo was made in northern Iceland. I was returning from a whale watching cruise and made the photo as our ship was coming into harbor. I remember being intrigued by the patterns on the water caused by the warm/cool pools of color and the black water that separated them. There is no horizon of which to speak. Yet the sea bird draws the eye to the centre of the frame. This middle ground is further emphasized by the demarcation, from top to bottom, in the frame made by the different patterns in the water that occur either side of the bird.